Click here to visit the Epize site and either signin with facebook or register. Next click on one of the bottles to see if you’re an instant winner. If you’re not, no worries because you’ll still be entered into their sweepstakes prizes. You can enter this sweepstakes every 2 week until September 19th. Good luck! ENTRY PERIOD 1 PRIZE: A Fire Pit & Four Adirondack Chairs, fulfilled as a $500 gift card. ENTRY PERIOD 2 PRIZE: A $2,000 Expedia gift card. ENTRY PERIOD 3 PRIZE: A $250 Seafood Feast & Grilling Accessories, fulfilled as an allfreshseafood.com gift card. ENTRY PERIOD 4 PRIZE: A patio furniture set, fulfilled as a $1,000 gift card. ENTRY PERIOD 5 PRIZE: A $250 Seafood Feast & Grilling Accessories, fulfilled as an allfreshseafood.com gift card. Terms and conditions apply. ENTRY PERIOD 6 PRIZE: A Weber Genesis S-330 Stainless Grill, fulfilled as a $1,000 gift card. ENTRY PERIOD 7 PRIZE: A Fire Pit & Four Adirondack Chairs, fulfilled as a $500 gift card. 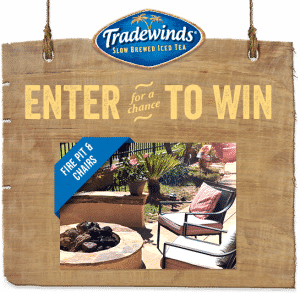 ENTRY PERIOD 8 PRIZE: Tradewinds Tea of the Month. One (1) case of tea delivered per month for twelve (12) months. ENTRY PERIOD 9 PRIZE: A $2,000 Expedia gift card. Instant Win Game Prizes: NINETY (90) FIRST PRIZES (FIVE (5) PER WEEK): A Tradewinds summer pack. Includes: Flip-flops, sunscreen, and sunglasses.